Ballpoint Universe: Infinite features a massive metroidvania style hub with many characters to interact with and many stages and challenges to find and tackle! The main draw of the game, however is its superb side-scrolling shooter stages which are in some cases randomly generated and can prove to be quite challenging, especially before you're able to purchase some of the better upgrades in the shop. At the beginning of each challenge you are able to purchase upgrades for your character/ship using ink. 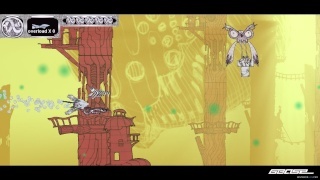 You can obtain ink on the platforming hub and as a reward for defeating enemies during the shoot em' up stages! 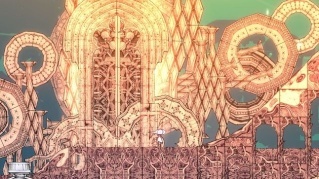 The game can be notoriously difficult at times due to the difficulty of the randomly generated challenge stages being extremely imbalanced. Usually it isn't impossible to do well in these stages, but on the occasions that it is players will definitely find it frustrating. The platforming can prove to be exceptionally difficult as well as some areas require precision jumps to reach and can take players many tries to finally get the timing right to reach the stages located in these areas! The controls are decent albeit a little unique during the platforming portions of the game, however the controls during the shooting stages are tight and easy to learn which is certainly great news! The graphics are gorgeous and the style feels reminiscent of the aesthetics of the 2D Paper Mario titles! The backgrounds are extremely detailed, the enemy models and characters are simple yet impressive! Honestly the graphics are one of the strongest aspects of this title! The music is also pretty good and it fits the game quite well, though it is certainly overshadowed by the game's breathtaking art-style. With great gameplay, decent audio, and breathtaking visuals Ballpoint Universe: Infinite is a solid game, however the difficulty of the game can be a turn-off for some players, but all in all we definitely recommend this game to Wii U owners who enjoy both platformers and shooters! Beautiful review as always Rukia-Chan! 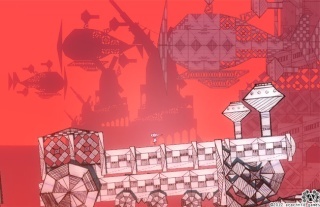 Ballpoint Universe looks like a great game! Great review dude. The art direction looks sweet!